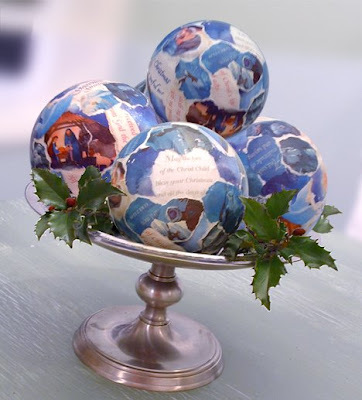 ... decoupage Christmas Card Balls: I took inexpensive paper maché balls and covered them with torn bits from last year's Christmas cards! Display in a bowl, in a basket, on your mantle or on a footed plate as I did in this photo. Accent with holiday greenery. First, decide if you would like a theme: a certain color; a subject like angels or nativity; or keepsake pictures from your friend and family's photo cards. Then, look through your cards to find pictures that can be torn into a small piece, yet still be identifiable. Begin tearing them out in irregular shapes. Keep the pieces in scale with the size of the balls. Use the artwork on the front of the card, as well as verses from inside. Prepare plenty of pieces before beginning to decoupage. Next, begin applying the paper shapes to the balls using the decoupage. Follow the instructions on the back of your brand of glue, but generally you will: coat the back of each torn piece using a brush or sponge, place the paper onto the ball, then brush over the top of that with another 1-2 coats. Overlap as you go, so none of the original ball shows through. 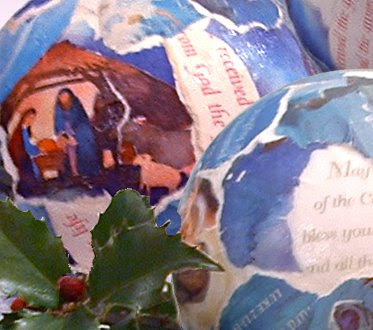 You could also purchase those plain brown assorted paper maché ornaments - they have a hanging loop attached. Decorate them using this same technique. Note to all Glitter Girls: Select a sparkly theme such as gold or silver and snazz these up with dabs of glitter or tiny shiny beads glued on after decoupaging. Visit the Inspired Room for Christmas ideas and traditions from others! NOTE: Don't forget to enter my gifts giveaway - see my previous post!! That would be fun to do with the kids...maybe we'll try it! Thanks for entering my giveaway. Good luck! Came on over from The Inspired Room to say hello. Great idea and excellent instructions! One more thing to put on my crafty list of things to do. This is a great idea thanks for sharing. Your blog is spectacular, glad to have found you! Beautiful! I'll be linking to this project. What a great way to use old cards! Great idea; I have 2 projects I've posted that are similar to this, one w/ fabric and one to make recycled holiday cards. This display looks great! How fun - and simply darling! Thanks for the fun crafty tip! !